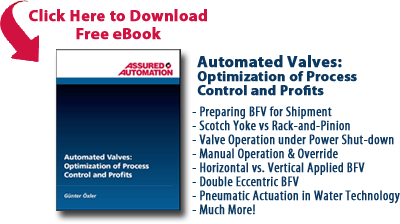 At last process engineers and plant managers can actuate their valves quickly and effortlessly, taking advantage of Assured Automation’s newest RM-150 electric actuator’s external wiring, to build “plug and play” solutions. The RM-150 is equipped with external DIN connectors for easy wiring. No longer do engineers need to open the actuator cover, risking exposing the actuator’s internal components to the elements, when assembling flow applications. Pre-wired power cords are also available. The RM-150 actuator delivers 150 in-lbs of torque, enabling it to open or close valves under high pressure. It is ideally suited for turning quarter turn ball valves from 1/4″ to 1-1/2″. The motorized actuator’s permanently lubricated, hardened steel gear drive, and its completely weatherproof factory sealed enclosed, compact package, eliminates maintenance. The manual override is connected directly to the output shaft and the position indicator is located at the top of the actuator. The motor is a permanent split capacitor type (PSC). Its automatic re-setting thermal protector will shut down the unit if it is excessively stroked in a high temperature environment. 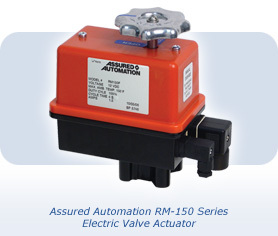 The RM-150 actuator is used successfully in both commercial and residential applications. For example, it performs well in rugged oil industry applications. Selected for its compact size, the RM-150 actuates pumps to drain depleted oil wells assembled on a mobile skid platform that travels across different well sites. For residential applications, its compact size and low cost allows automatic water shut-off systems to be built and installed conveniently between the studs in walls of houses. Electronically operated water shut-off valve systems use the RM-150 actuators to protect buildings from water damage caused by leaking or broken pipes, hoses from washing machines, ice makers, toilets, water heaters, providing a simple, inexpensive precaution that can avert potentially thousands of dollars in damages. This entry was posted in Latest News, New Product Announcements and tagged Electric Actuators, Valve Actuators. Bookmark the permalink.